I will continue to develop and update this concept as it develops. I am creating a character for the album called Luff. The name comes from the idea that our ability to make the best rational choices can be influenced by the fluff in our heads. The fluff in our heads can be caused by fear and other forces. This could in effect impede our attempts to move forward with our desires, dreams, etc. Luff sounds like it could belong in a children’s story, however this is a disguise to represent how many forces are not recognized or just ignored. This metaphor is intended to show how fear and other forces are meant to keep us in a child like state and docile. The documentary “The Century of the Self” portrays an attempt by a minority of individuals who want to keep the masses from thinking on their own. Fear and the fulfillment of desires can both be used to accomplish the same task. Fear through propaganda and intimidation. Fulfillment of desires through providing wants and pleasure. In the world where Luff resides these forces fight to influence everyone’s choices. These beings are provided with a variety of methods for which to evade, fight, hide and/or protect themselves from these forces. One method involves sealing the mind. Since the mind is in the brain many, including Luff, have chosen to keep their head sealed inside a container of some type. Luff carries his head in an aegis box. Others carry theirs in a aegis satchel, an aegis sack, a aegis backpack, etc. They remove their heads from their bodies to keep the two separate. This negates the need to think about what is happening to them and removes the need to think about those forces. 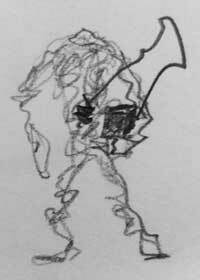 The dark line in the concept art shows that the mind is still connected to the body. Fear in the mind will impact the body represented by phrases such as: “I have a gut feeling” or “Something’s wrong. I can feel it.” I created this wire type figure with an intention of placing it in an animation showing the lines moving constantly to represent anxiety and jitteriness. The problems in Luff’s world started when the environments became hostile. Those environments were infested with fears and anxieties and torments. Luff was overly susceptible to them and stayed hidden afraid to venture forth and learn. This journey begins when Luf makes a decision to explore the environments. Luff has real difficulty doing this but takes a step to do so. Two companions convince Luff to keep going. The companions have alternative motives and fight for control of Luff’s aegis box. They lead Luff through dangers to the final end of the journey. What will Luff face on these paths? How will Luff react? What will be Luff’s fate? The concept drawing on the right shows the Luff character in an environment that is interacting Luff’s mind without Luff’s knowledge.